Some days are rushed, but others present a perfect opportunity to play with your camera. 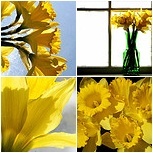 Last week, a friend gave me a bouquet of daffodils. They looked so bright and springlike, that I decided to shoot some pictures of them. The hour was early, and light came in only one window. First, I stood by the window to shoot the flowers, which jumped out against the darkness of the room behind. Later, though, I tried other positions, such as standing in the room and shooting toward the window. Then I wondered how the flowers would look in my upstairs room with the skylight, so I dragged the bouquet up there to shoot some more. Thanks to the economy of digital, I soon had over 100 images, most of them slightly out of focus, off-kilter, or overexposed. However, I noticed that as I shot more and more pictures, I tried crazier things, like lying on the floor and shooting straight up. I also began to notice subtle differences in composition, which I hadn’t noticed before. 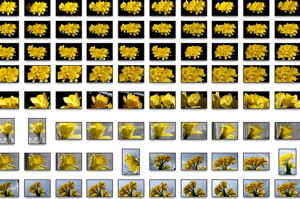 Some pictures, for example, showed the blossoms surrounded by a sea of black, while other pictures were almost entirely yellow. Yes, you can crop for the same effect, but getting in close improves the amount of detail you can capture. Once I noticed more, I experimented more, and in the end I had more than 200 images. At least half were deleted quickly, and more were deleted after careful inspection. The ones that remained, though, provided a rich source of ideas, as well as the images themselves. The next time I shoot any bouquet, I now know at least five different ways to go. I know that certain photographers set up photos in studios, light them perfectly, and take only a few wonderful shots. However, I want to encourage everyone to try setting aside a period of time and shooting like crazy. Do this with the purpose of trying out different exposures, locations, positions, light sources, and compositions. Not only are you guaranteed to get some interesting images, but you will probably have a grand time doing it.